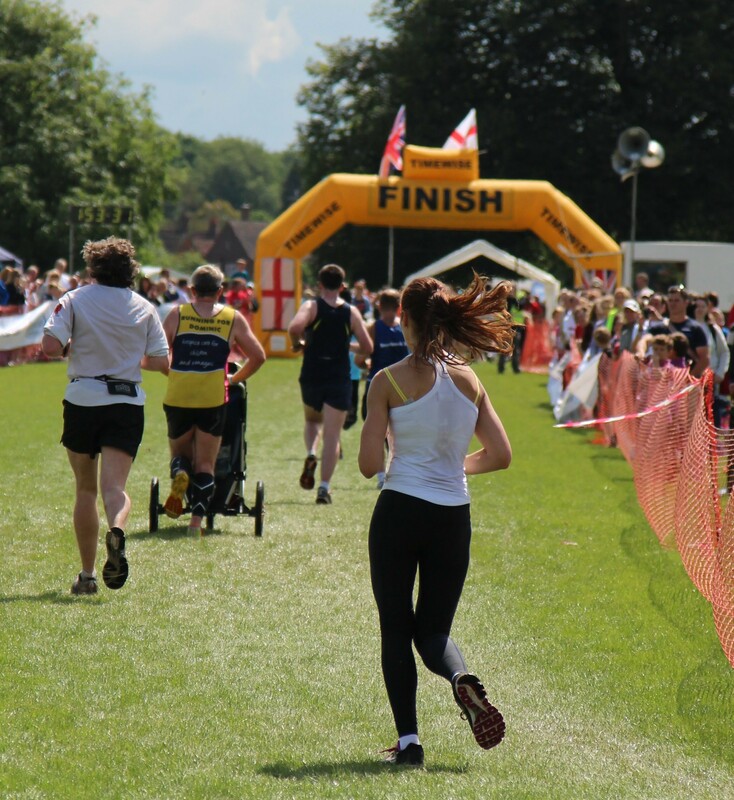 This Sunday was simply the perfect day for the annual Wycombe Half Marathon & 10k race. As this is the most local race to me, participation was almost non-negotiable! After weeks of rain, flooding and grottiness, our town finally woke up to a gloriously bright, sunshiny day with crisp air and birdsong. Simon dropped me by the Rye, which is our local runners’ (as well as dog walkers’ and baby-boomers’) paradise and also the starting point for the race. As soon as I got out of the car to trot to the start line, I got swept up by a huge influx of runners and soon found myself in the middle of a buzzing “bee-hive” like place filled with hundrends of participants excitedly chattering or manically warming up for the upcoming challenge. During the build up to the start, a voice from the loudspeaker expressed sympathy for those who were first half marathoners or those who chose to do the Wycombe half for the very first time (including myself). As he encouragingly put it “don’t worry, contrary to popular belief, there are some flat bits in High Wycombe, we just chose not to include them in the race…Good luck to everyone’!” I tried to distract myself from thinking too much of the upcoming hills and questioning my sanityby devo ting my attention to some stretching and diligent warm up. I knew it very well that the Wycombe half was notorious for its challenging course and had a reputation of “welcoming” runners with a very steep hill right at the beginning of the race (Marlow Hill)! We were soon called to line up to the start line, which turned out to be a huge grassy patch in the middle of the Rye – the most broad start line I have ever seen! At least this way everyone could avoid the usual “sardines in the tin” pre-race feeling or disappear quietly without anyone noticing LOL. The guy in the loudspeaker called out a guy called Mike Blowing to the front who used to be an actual torch-bearer a few weeks ago in Aylesbury. The sight of the torch triggered some loud cheering and clapping but the real spectacle was Claire Hallissey, who is going to complete in the London Olympics as part of Team GB. “Today’s race is going to be a little warm up for her”, I thought. It was enough to lift our spirits and launch ourselves into the hilly race with a sense of camaraderie. To my surprise, the first hill was nowhere as bad as I had expected it to be. I thought we were going to run up Marlow Hill, but we did that instead by going through the park of Wycombe Abbey School which had a rather windy road with occasional flat bits which allowed me to get my breath back again. By maintaining a slow but steady pace throughout the climb, I managed to reach the top feeling strong rather than drained out of all energy and could nicely recover on the subsequent flat and downhilly section past the Daws Hill RAF base. As soon as we emerged from the park and the trees which had provided us with a cool shelter, we found ourselves bathing in blazing sunshine on the main road leading into Flackwell Heath, at which point I started to feel concerned about hydration. Knowing there would be drinking stations, I had not brought my own bottle, not wanting to carry any excess weight. Fortunately, the drinking stations were well positioned so I could avoid getting de-hydrated and overheating. These two things are deadly enemies in hot weather and can finish you off in a very nasty way! The “point of no return” came just after the 5k mark when our group divided into two, runners who had signed up for the 10k part of the race disappeared by turning left, and the rest of us carrried on for another “leisurely” 16k! I was surprised at how much the half marathoners’ group had thinned out, but I had to remind myself that it is only a small and rather under-advertised race in comparison to the “biggies” such as Reading or Marlow. The rest of the race was very similar to the Reading half, leading us through more rural areas with a gorgeous view of the valley ahead, on pavements and roads, through narrow alleyways, except that there was no huge crowds to the extent that the organisers had not even bothered getting all the roads closed for the race! In earnest, I welcame the running in “small pack” atmosphere as the disturbing memory of seeing people trampled upon and swept off their feet by the crowds in the Reading Half was still too fresh in my mind. Not being consumed by a claustrophobic and noisy atmosphere, I was able to maintain focus and good pace discipline throughout and listen more intently to my body’s reactions to the increasing mileage. I had no illusions that I would start to struggle towards the end given I had not trained enough for the race, the longest distance I had run in training during the weeks leading up to the race was a modest 15k, but I kept my hopes alive that if nothing else, my good endurance base and the adrenalin and the cheers from the spectators would keep me going till the end. I felt the happiest when around mid-way into the race, we encountered a steep, downhilly section which lasted for at least a blessed 1k, and I could use this section to make up for time lost during the Marlow Hill climb and to actively recover (obviously running on a steep downhill puts a strain on the hamstrings and knees but by striding carefully, the impact can be minimised). I often use this technique in running when time matters – I run hard and fast before I know a nice downhilly section is coming up which will help me recover without slowing myself down. I was ready to collapse on the final grassy section just before reaching the finish banner, but catching a glimpse of Simon with his camera in his hands brought a smile on my face and I even managed a tired wave for him. (When I looked at his pictures later, I had to ascertain I indeed looked like someone ready to die!). Just as I was about to decide to walk the final few metres (there is no dignity in collapsing! ), I heard my name called out by my friends Becky and Andrew, who came to see the race finishers after going to church. My face lightened up again and found myself waving back at them and then gave one final shot through the finish line, where I nearly collapsed on a lady who waved her sensor accross my time chip to take the time. After collecting my well-deserved goody bag and medal, I did need to sit down for a moment! When I looked at my finish time, I nearly cried, I was so happy I had completed the race well within the time I had hoped to achieve! With a time of 1 hour 54 minutes, I just made it into the top half of the over 800 finishers!! Claire Hallissey won in the women’s category (why am I not surprised LOL) with a time of 1.16.01. In the interview she gave to the Bucks Free Press she said “It was quite nice hanging around with all these great runners” and I thought what a privilege it was to race that day with someone who may win a medal the Olympics!! This was such a great race with efficient marshalling, a challenging route, good organising and a very generous goody bag in the end, and all this at a reasonable entry fee! I will definitely be back next year. What have I learnt from the experience? If you can run a good 10k in training, you can run a decent half marathon. Relying on mental strength is as key in a race as putting in some robust training. I think in this race I relied on mental strength more than on the training I put into preparing for the event. At the end of the day, finding a good balance between the two and entering any race with realistic but healthy ambitions is what gives you a fantastic experience.